We choose the vendors who will be at S|H|E Day with a lot of thought...and usually there simply isn't enough time to really tell you why we love them! We "discovered" this wonderful shop curated by Rhonda last year when we were on the hunt for some ethical notebooks for the SHE office! We ordered a Denik notebook (I highly recommend them - they are recycled, lay flat, and give back to education programs worldwide!) Rhonda has incredible taste and brings together so many cause-based brands. She makes shopping ethically so easy and fun! And she was a huge cheerleader for making S|H|E Day happen in Phoenix! Use the code TAKE25 to take 25% off your entire purchase at redemptionmarket.com! In a stack of coins, no one ever reaches for the pennies. So are they worthless? 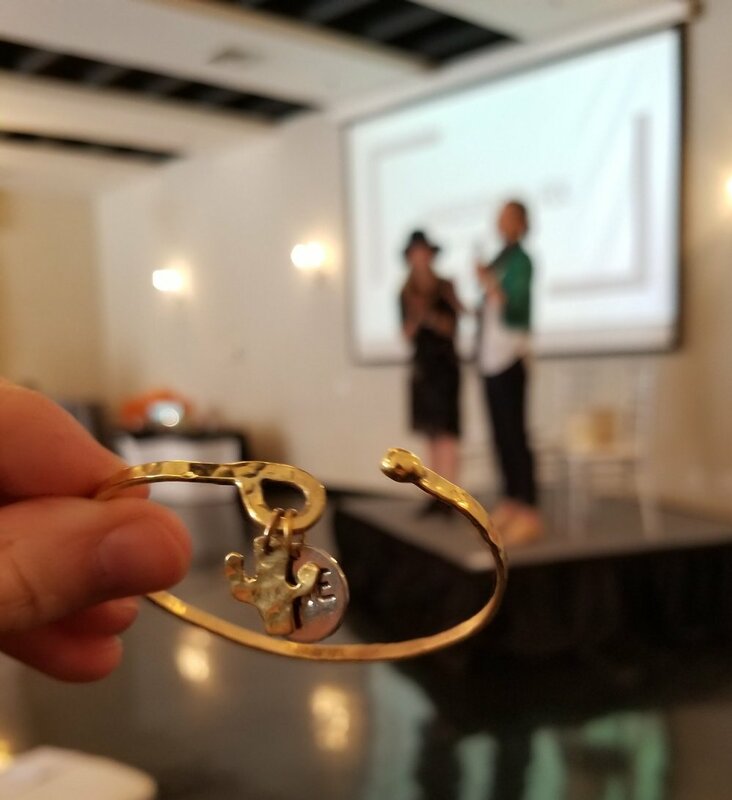 Not according to The Soteria Initiative, a Phoenix-based company that uses pennies in jewelry to show survivors of human trafficking that they do have WORTH and to provide them with employment. 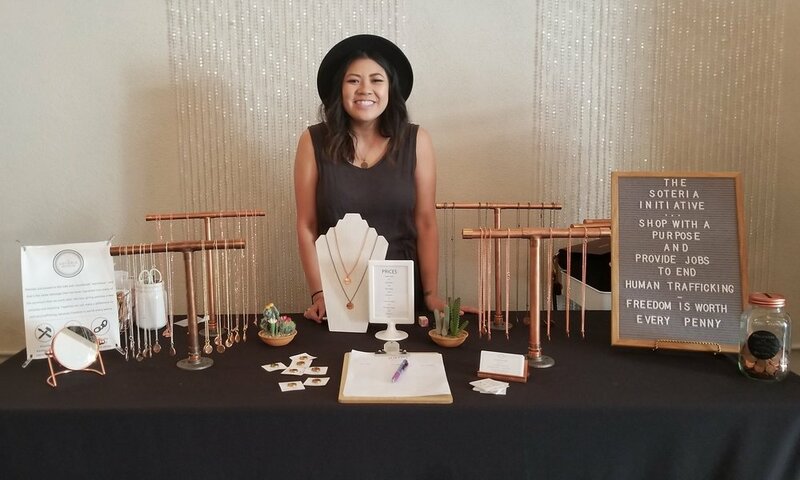 This unique case-based jewelry was at @s.h.e.day - and we absolutely loved their mission! Oh, and its founder, Khue, has the cutest 9-month old son. 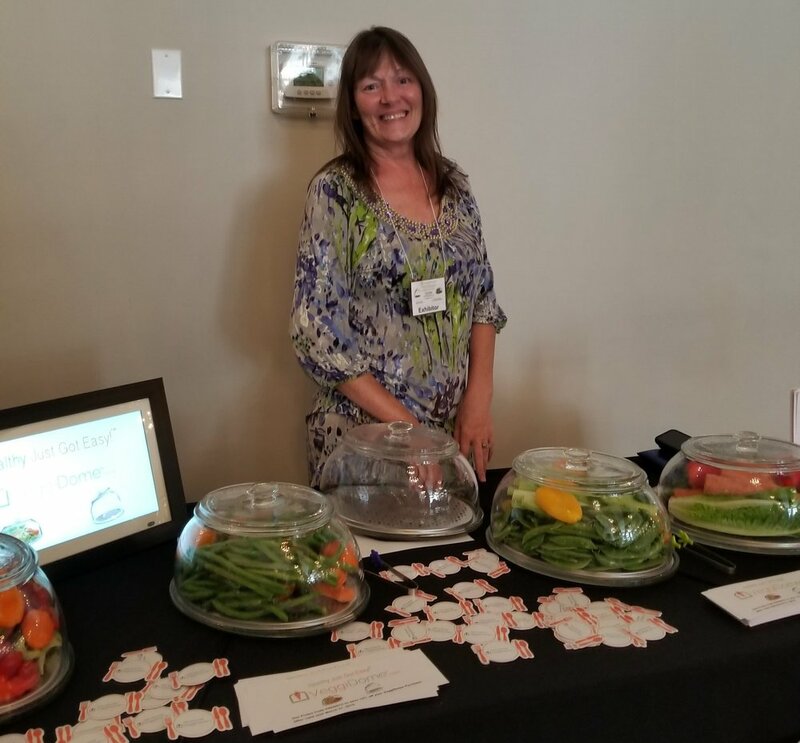 She was one of many mom's on a mission at the event! Use the code SHEDAY for 20% off any necklace! We’ve all grown up hearing how important it is to eat your veggies… but that’s hard for a couple reasons! One is that they’re often in your refrigerator and you forget about them. The other is that you don’t store them correctly and they go bad! VeggiDome fixes both those problems. Now, you can keep your vegetables on display on your counter and keep them fresh for days! USE THE CODE SHEDAY TO GET 15% OFF AND FREE SHIPPING! 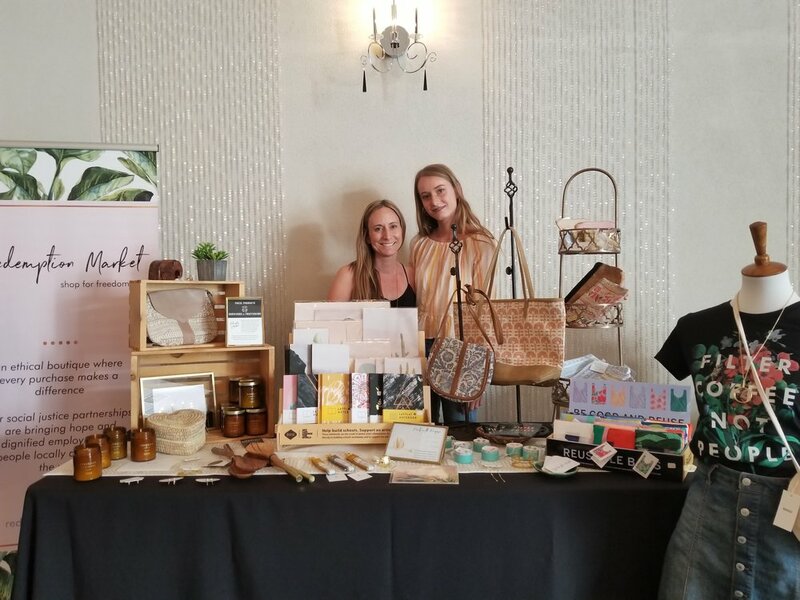 A mother-daughter owned and operated brand, Lucy + Jo creates traditionally-crafted, African jewelry and household goods with some modern influences. A mother-daughter team, Lucy + Jo was born from a love for making stuff and the people of Africa. Handmade jewelry and household goods are created with traditional craftsmanship and modern influences by artists in Kenya and Uganda. These jobs allows them to overcome social challenges in a creative way. Not only does the fair-trade brand take care of people, but part of the profits are donated to the non-profit Gorilla Doctors! Beauty can be found in a variety of places, and especially in Lucy + Jo products! We also launched a special SHE Thrives Bracelet for S|H|E Day and we love it! As the hand beaten cactus charm symbolizes, we can all THRIVE, even in the harshest of conditions! And the SHE charm reminds us that small sustainable, healthy, ethical changes are all around us. Most importantly, this provides jobs to metal workers in Kenya striving to provide for their families, and support a women-owned company. So much GOOD! USE THE CODE SHEDAYPHX FOR 10% OFF YOUR FIRST ORDER! Take Care Beauty Co. is such a local gem! It is woman-owned and provides super clean, healthy skin care products! Each ingredient is included for benefits to your skin. No nasty, unwanted chemicals, and no animal testing. Plus, all the products are handmade in the sunny Phoenix, Arizona and you can actually recycle your empties if you live locally, which we LOVE! We can’t say it any better, so we won’t even try to! These pieces are also sustainably made in Phoenix. They are beautiful and timeless so they’ll be bringing your family together for generations to come. And it's woman-owned...You know how we feel about that! 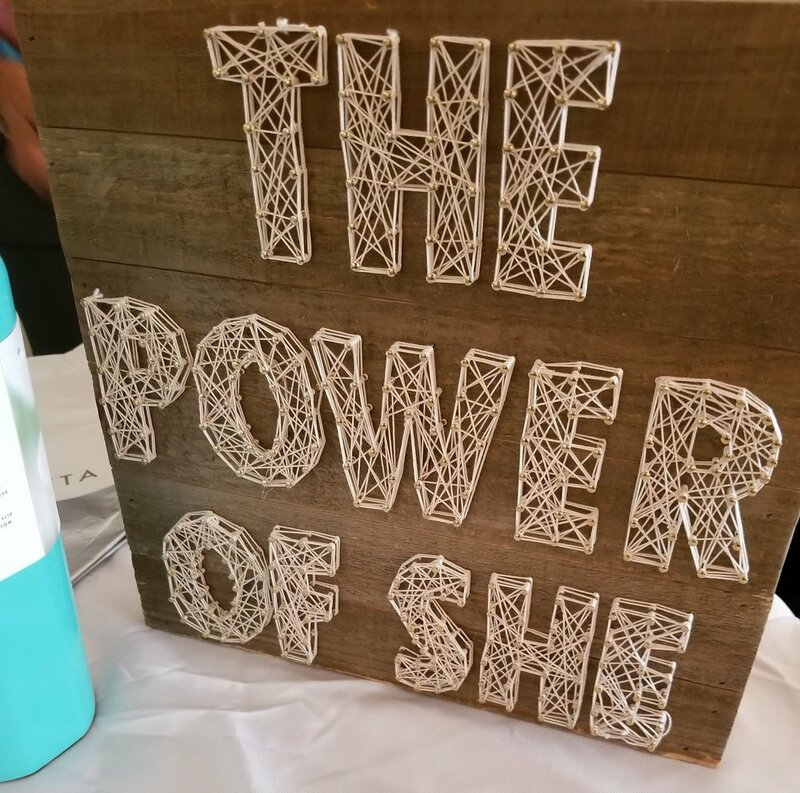 We love celebrating smaller, women-owned brands BUT we will also highlight some national brands because they are doing great SHE-worthy things and creating change and awareness at a bigger level - which is exciting! Beautycounter is on a mission to clean up the women's make-up and self care industry and it deserves applauding! 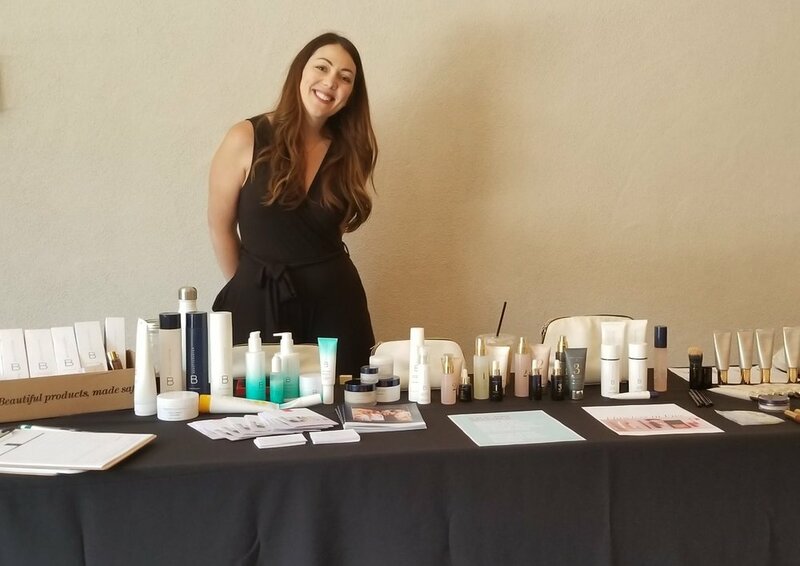 We were lucky to have Shea Smith bring the full Beautycounter lineup and also speak and share simple tips for getting started with switching out your makeup and beauty products! Did you know you can actually shop from SHE Changes Everything’s Beautycounter?! We fully support their mission to get safer beauty into the hands of everyone and this helps us fund SHE. Their high quality products are made without any of the toxic chemicals most brands have, so you can look good and feel good without worrying about the products you’re using on your skin. Women are filled with an unlimited potential that Athleta recognizes and attempts to match in their clothing innovations. Their athletic clothes are made to take on any challenge, just like you.Their products range from sports bras to jeans with almost every article of clothing in between. Athleta also understands the importance of goal-setting and has set several in regards to sustainability that we’re excited to see them reach in the next couple of years. They are diverting waste, conserving water, and creating higher quality products made from sustainable materials, including organic cotton. Not only do they promote fair trade, but they have other programs for the thousands of women making clothes. These programs teach them valuable life and leadership skills to help them further develop their careers and communities. Did you also hear that Athleta recently achieved B Corp status?! That means they are committed as a business to have ethical and sustainable practices. We love essential oils and doTERRA is one high-quality brand - among many - that we recommend! This new Harmony Kit is a fun kit for making your own perfume blends and one of Jennifer's favorite recommendations is the blend Clary Calm, which provides awesome hormone balancing for women, especially around your period! This Phoenix-based photographer is a family photographer with a journalistic style of capturing "the beautiful, fragile, blissful, exhausting season of 'right now' for families." We cannot recommend Erica's work and her professionalism enough! Artisana Organics - Handmade with care, these organic foods are crafted using a temperature controlled process. Everyone at SHE Day went home with a packet of creamy coconut butter to use in their own lattes! Your lattes will never be the same - and coconut butter is SO GOOD FOR YOU! Navitas Organics - Navitas (Nuh-vee-tus) is Latin for 'energy.' Cool, right?! This company searches the globe for the highest-quality organic superfoods for you! Bri used Navitas' maca (but they sell a great matcha too! Don't get them confused! ; ) for her lattes at S|H|E Day. Ladies, maca is your hormones' best friend. Maca is part of a rare group of plants called adaptogens. Rather than target one specific organ or system, adaptogens help the body achieve a state of balance throughout to encourage overall health. Vital Proteins - Bri used the new blend of matcha (Matcha contains 137 times the amount of free radical-fighting antioxidants as other green teas!) and collagen (collagen is a protein that is also a major component of bones, skin, muscles, ligaments and tendons. Think of it as the "glue" that holds your body together. Your body makes it, but as you age it produces less and less quality collagen so supplementing can be a huge health boost!) And everyone got to take home a packet for collagen. High five, Vital Proteins! This blend keeps selling out so we had to all cross our fingers it would be back in stock and available - IT WAS! We love coffee and exploring new cafes and roasts in new cities brings us a lot of JOY! But we're always looking for organic, fair trade coffee whenever possible. It's healthier to drink, good for the environment, and good for the people who grow it! We were so excited to find a local coffee shop, Organic Bean Cafe, run by a mother-daughter duo who uses locally roasted custom blended organic and fair trade coffee (and organic, fair trade chocolate and vanilla!) from Bergie's Coffee Roast House! Both companies donated time, resources, and coffee to bring delicious cold brew and blended drinks to S|H|E Day. They were so good! We can still taste the vanilla cold brew!! If you live in the area, be sure to check them out! Every SHE Day is a chance to grow and get better and nothing proves that more than our chalkboard signs. If you saw the signs at SHE Day: LA compared to these beauties from Etchings by Emma, you'd laugh out loud! We are so grateful she brought her talent and vision to all the signs for SHE Day: Phoenix. If you live in the area, check her out for any events or parties you hold. She's endlessly creative and will bring your vision to life! Juicetown Jailhouse was such a FUN addition to S|H|E Day! Their smoothies, bowls, and salads were not only delicious, but locally sourced (no carbon footprint and FRESH!) and organic. You need to follow them if you live in the area and find out where they pop up. Their food is so good!